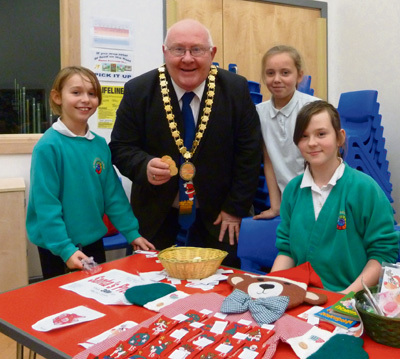 Santa wasn’t the only special guest at St Keyna Primary School’s Christmas fair on December 14. Chairman of Bath and North East Somerset Council, Councillor Rob Appleyard, also joined youngsters and their families at the event organised by the Friends of St Keyna (FOSK). Mr Appleyard praised the parents who gave up their time to organise the event as well as the youngsters who took charge of running many of the games and activities on the day. He was also given a tour of the school before the fair opened, and said he was impressed by the “happy and responsive” pupils.